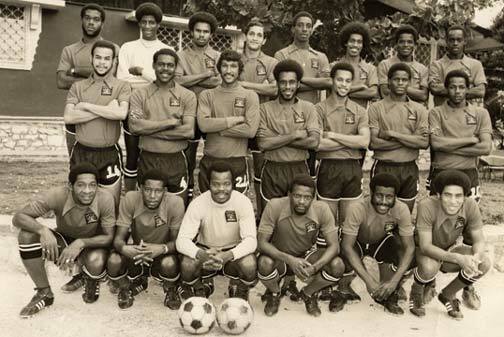 The Trinidad and Tobago team that played Haiti in 1973. Back row (L-R): Lawrence Rondon, Devenish Paul, Peter Mitchell, Steve Khan, Dennis Morgan, Leo "Twinkle Toes" Brewster, Tony Douglas, Henry Dennie. Center row (L-R): Leon Carpette, Selwyn Murren (capt. ), Gerald Figeroux, Sydney Augustine, Russell Tesheira, Ramon Moraldo, Steve David. Front row (L-R): Selris Figaro, Wilfred Cave, Kelvin Barclay, Warren Archibald, Gally Cummings, Ray Roberts. Photograph courtesy Everald Cummings. Caribbean Beat, issue 97.